Sleep and insomnia are among the most common problems that people with moods seek help for. We have written many posts about various topics related to sleep and insomnia. This page is intended to be an overview of the topic. A colleague of ours, who is an expert in sleep, suggested, only somewhat in jest, that mood disorders should be considered a type of sleep disorder. Part of what he was talking about is new evidence that what drives mood instability for many people is disrupted sleep (and wakefulness) rhythms. He also called our attention to studies showing that people with mood disorders had abnormalities in the parts of the brain that regulate sleep. Biorhythms – which include circadian (roughly one day long) rhythms as well as seasonal variations in sleep and wakefulness, as well as mood (seasonal affective disorder). Other sleep disorders – including obstructive sleep apnea, and other sleep disorders which occur more often in people with depression than in the general public. Medications – what do we know about medications to help with sleep? Other treatments – psychotherapies are actually more effective than medications. But they get used much less. Why do we sleep? What is the point of this activity? There are some tantalizing findings about how different types of sleep affect the body’s recovery from injury and also memory and brain functioning. Both deep sleep (slow wave sleep) and dreaming sleep (REM sleep) have been associated with improved learning and memory. The experiments of Huber et al showed that after learning a particularly demanding task, slow wave sleep was greater in the part of the brain that was activated by that task, and the amount of slow wave sleep in any given individual in that area predicted later memory and performance of the task. Evidence in favor: All aspects of functioning are significantly impaired by insomnia. Growth hormone is increased after sleep. There is a greater need for sleep after sleep deprivation (meaning there is a “need” that the body feels for sleep). Evidence against this idea: A decrease rather than increase in protein synthesis of the whole body during sleep in humans. Most of the more than 30 studies on exercise and catabolism show no increase in sleep – as would be predicted. Evidence in favor: Sleep is like hibernation. The same brain structures and neurotransmitters that are involved in the control of sleep are involved in the control of body temperature. Evidence opposed: Sleep only reduces metabolism by 10% and this shouldn’t be enough to lead to the universal evolution of sleep. Some of the functions of dreaming (REM sleep) may include stimulation of brain growth; fine tuning of the binocular oculomotor system, consolidation of memory, erasure of inappropriate memories, and the harmless discharge of strong emotions during sleep, which would otherwise intrude into waking behavior. The prolific amounts of REM sleep during fetal and infantile development argue for a developmental role for dream sleep. The most effective treatment for insomnia is not medication at all, but rather cognitive behavioral therapy. Scroll to the bottom of the page to find information about a program that can be done using your computer and the internet that has helped many of our readers with long term significant improvements in the quality of their sleep. 1. Sleep hygiene therapy. This focuses on trying to make sure that the room that you’re going to sleep in is cool, dark and quiet, and that you’re making an appropriate transition to sleep (not trying to go 1,000 miles an hour and then just hoping that your brain will shut off when you lie down). 2. Sleep restriction therapy. The focus of this treatment is trying to get people who may have developed anxiety about not sleeping (Oh my God I can’t get to sleep again, I am going to be a wreck tomorrow, I have to get asleep… etcetera) to re-associate their bed with relaxation and sleeping rather than with worrying. People are allowed to be in bed for a limited amount of time (short enough so that it will quickly guarantee that the person is sleeping almost all of the time they are in bed). Gradually that amount of time is increased until the person has a stable daily routine of sleep. We have recently become interested in augmenting sleep hygiene therapy with other techniques to strengthen circadian rhythms described in this post. We have separate pages that discuss sleep medications and natural supplements that may be used for insomnia. One of the most frequent causes of insomnia is anxiety. Insomnia of this kind is caused by increased activation of the sympathetic nervous system at night. The body releases norepinephrine (the flight or fight hormone) at night when that system should be inactive. Sleep hygiene techniques may be helpful, especially those targeting anxiety. Many people find the regular practice of meditation is especially useful for this kind of insomnia. People with mood disorders appear to be at greater risk of dysregulated circadian rhythms which can show up in various ways as insomnia and fatigue. A good overview of this and an integrated treatment approach to supercharging your circadian rhythms is to be found on our sister site, moodsurfing.com. 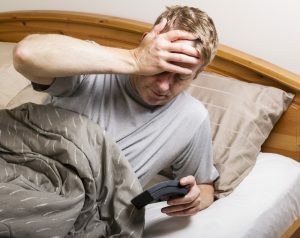 People with this kind of insomnia have poor quality sleep at night (they don’t go into consistent deep sleep) and impaired alertness during the day because their body’s natural biorhythms (patterns of release of hormones) which are what cause alertness and sleep to take place in a regular cycle are not strong or are disrupted. This kind of insomnia is particularly common in the winter when many of us get very little natural light and this leads our bodies and brains to be quite confused about the time of day. The techniques below under the heading Change Your Sleep Cycle are useful for this kind of insomnia. A common cause of daytime sleepiness and insomnia is a mismatch between your body’s normal sleep cycle and the sleep cycle you need to follow in order to work or do other daytime activities. People with this condition find that they are night owls who have difficulty getting to sleep early enough so that they can have a full night’s sleep before they have to wake up. You can also read more about this condition on a blog post about delayed circadian rhythms. Keep a regular sleep schedule – our bodies and brains cannot change the times we sleep suddenly, before electricity the time we went to sleep and the time we woke up never varied by more than a few minutes a day. Adjust the bedroom environment – make sure that your room is cold and dark and quiet. Deal with your worries before bedtime – it may be helpful to write down your worries and plan some time in the future to review them. Do not watch TV, read, eat , or worry while in bed – your bed needs to be associated with sleep. • Figure out in detail a plan for getting up earlier. Imagine as you are going to sleep what it is that you are going to do when the alarm goes off (“without thinking about it I will get out of bed and go take a shower, or I will go outside and get the newspaper, or I will go out in my PJ’s to Starbucks…”). The key parts of the plan are – to have a goal that is pretty easy to reach, to tell yourself you are not going to think about it, and to do some of the work the night before (set out your clothes… set multiple alarm clocks… tell your partner to pull off the covers). • When you get up get some bright light exposure before you tell yourself that you can go back to bed (30 minutes at least of therapy light or sunlight exposure). • Ideally add to that either some physical activity (walk) or a conversation with someone. • Continue to do this for at least a week. At the end of this, even if you have gone back to sleep for naps, you should find that you are going to sleep earlier, waking up earlier, your mood is better, you are more alert in the daytime and you sleep more deeply at night. We now offer two online CBT for insomnia treatment programs at Gateway Psychiatric: SHUTi and Sleepio. A summary of CBT for insomnia and information about how to sign up for both of these programs is here. The Insomnia Workbook and Say Good Night to Insomnia.